Everybody talks about Tube & Berger at the moment. They present themselves expressively with their charity project “It began in Africa” and the accompanying single “Free Tribe, ” which made it to No. 1 on the Beatport charts. The project was published to support the children in need of help in Africa on their label Kittball Records, which they founded in 2006 and, since early 2010 both of them collaborate with their friend and DJ Juliet Sikora. In addition to publishing the productions on their own label, Tube & Berger make music on labels like Great Stuff Recordings, Moonbootique, Trapez, Ministry of Sound, and others. Many of their singles reached international attention and succeeded even up to No. 1 on the US Billboard Dance charts. 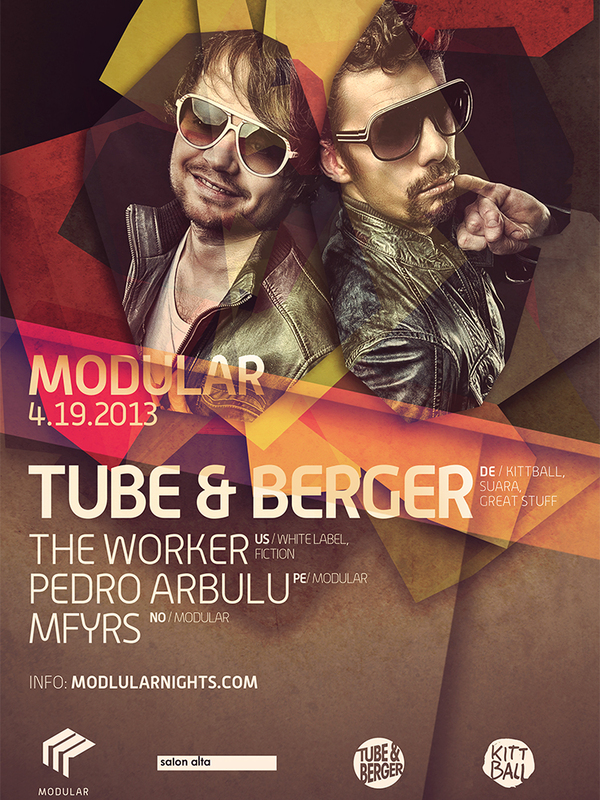 They expressed the essence of the powerful and slightly playful “Tube & Berger” sound. It all started with a punk band in the early nineties which has developed into a Tech House Act over the years. Both of them, however, could not and would not give up the punk attitude until today. Tube & Berger is just a bit different. That is what extinguishes them from the others. These days, the established German can be found at Beatport’s top position with “Imprint Of Pleasure”. It starts with acoustic guitar, adds in the beat along with a haunting vocal sample, and takes us into a smooth and fantastic reminder that summer time is not too far around the corner. Growing up in a small industrial town in Germany and confronted with the boredom that comes with it, Tube & Berger, aka Arndt Roerig and Marko Vidovic, found music at an early age. Then, age sixteen, the two found themselves performing stage shows in a punk band when the 90s House and Techno boom hit town.Driven by the challenge of giving electronic music an organic and live character, they made their breakthrough in 2004. The Song Straight Ahead featuring new wave legend Chrissie Hynde climbed straight to the top of the US Billboard Dance Radio Charts and bookings from all over the world started to roll in.Wanting to have the freedom to pave their own musical path and not have to bow down to a major label dictatorship, or be lured by money-grabbing managers, the two decided to establish their own label Kittball Records, with their friend and colleague Dj Juliet Sikora. Tube & Berger released their first studio album titled Introlution. Introlution is being released on Kittball Records at the end of June 2012. On the album, the duo hooks up with Chicago House legend Robert Owens, the trumpeter Thalstroem, Berlins Meggy, Kittball newcomer PAJI and of course their label partner Juliet Sikora.Introlution is a fresh new approach to the club sound and has a touch of the duos punk rock attitude mixed in for good measure. The overall feeling is a clubby album that will surely define the sound of 2012 and 2013. Recently relocated to Austin from San Francisco, The Worker (Michael Kelly) has been DJing and promoting house and techno events since 2007, starting with the rowdy monthly party Fiction, co-produced with DJs Andre Lucero and Christian Blaafjell (MFYRS). Hosted at Vertigo, with a healthy pinch of unruliness seeping in from SF’s rather vivid Polk Street, the night consistently delivered a dizzying dose of techno, electro and mutant disco for a few bleary-eyed years before making it’s way to SF’s tiny underground dance music gem, 222 Hyde. In addition to hosting local talent such as Sammy D. (PillowTalk), Anthony Mansfield and Tal M. Klein, Fiction also welcomed Lee Foss, John Selway and Rob Rives for special one night events. Outside of Fiction, The Worker regularly played throughout SF, opening for artists such as Stacey Pullen, Claude Von Stroke, Adam Beyer, Joel Mull, Morgan Geist, Tom Middleton and Worthy. During the last couple years The Worker focused his energies on producing and playing the Friday night underground house and techno happy hour White Label, held at Sixth St.’s Showdown with residents Michael Perry (x2) and Matt Wilder. Special guests included Jonah Sharp, Dave Aju, Eric Cloutier, Michael Tello (PillowTalk), Mr. White, Kevin Knapp and numerous other talented DJs from SF and beyond. Over the years The Worker has found a sound that moves from funk-driven deep house to swirling mutant disco to chunky rolling techno with it’s gaze slightly tilted upwards. Just settling into Austin, a city with it’s own rich musical history, The Worker joins a growing electronic music scene and continues to actively DJ and promote events while developing new musical projects. Performing alongside some of the worlds top electronic music artists, Moby, Max Cooper, The Martinez Brothers, Matthias Tanzmann and Martin Buttich, Pedro continues to connect to listeners with his heavily influenced sounds of House, Techno and Progressive. He draws his inspiration from the growing number of electronic music listeners around the world. Beautiful San Francisco waterfront location, on the Embarcadero with amazing views of the Bay Bridge, will be announced the day before the event.